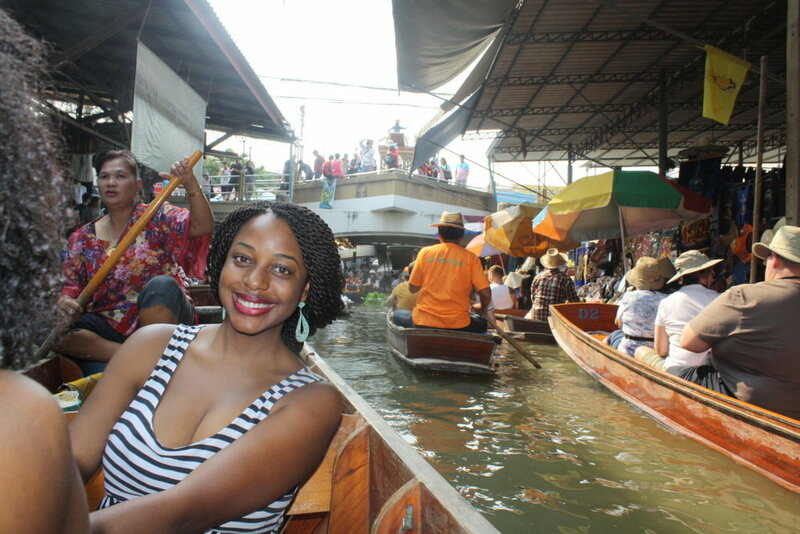 Venice and Amsterdam aren't the only places with canals--Thailand has them too! We took a day trip from Bangkok to the Damnoen Saduak Floating Market, a must-visit for anyone's first trip to Thailand. Although the biggest, most vibrant floating markets have evolved from authentic to touristic, we nonetheless had a wonderful time. We booked a 6-hour tour with Viator, and for $40, we got quite the experience! We drove about an hour out of the city, stopping at an orchid farm and coconut-sugar processing farm along the way. Once we arrived, we took the splashiest longtail boat to the canal where the market was, where we then got aboard a much narrower longtail boat and we drifted through the canals, where we enjoyed drinking the nectar of fresh Thai coconuts, a hot bowl of noodles, fried spring rolls, and of course, fresh Thai fruit. Thai fruit can, and should, be purchased from just about any decent-looking cart, stall, or booth. I was particularly partial to the fruit being on ice, but this matters less if the fruit was recently cut. Mango was so fresh, sweet and plentiful, that I failed to even take any pictures. It just seemed so normal to be able to buy a bag of 2 freshly-cut mangoes, skewered, for 60 Baht ($2) along any street or at any market. Now that I'm back in chilly New York, craving mango more than any other part of Thailand, I realize how fortunate we were. Some fruit stands that sell a huge variety of fruit will even cut your mango to order. While in Phuket, I witnessed this, as the fruit seller expertly and effortless skinned and sliced two huge mangoes for me. Mangosteens, which are nothing like mangoes, were also a favorite. Mangosteens remind me of a lychee-citrus hybrid. Like lychee, you easily peel a hard shell off of the fruit, and the inner fruit was delicate with a delicate flavor. However, the fruit was in sections, like a citrus. I also sampled dragon fruit for the first time. The delicate flavor and kiwi-like texture did not live up to its vibrant, magenta-colored skin and ferocious name. The flavor was almost--nonexistent. This fruit was all texture. However, unlike a kiwi, the tiny black seeds inside had no direction! They were just scattered throughout the fruit. 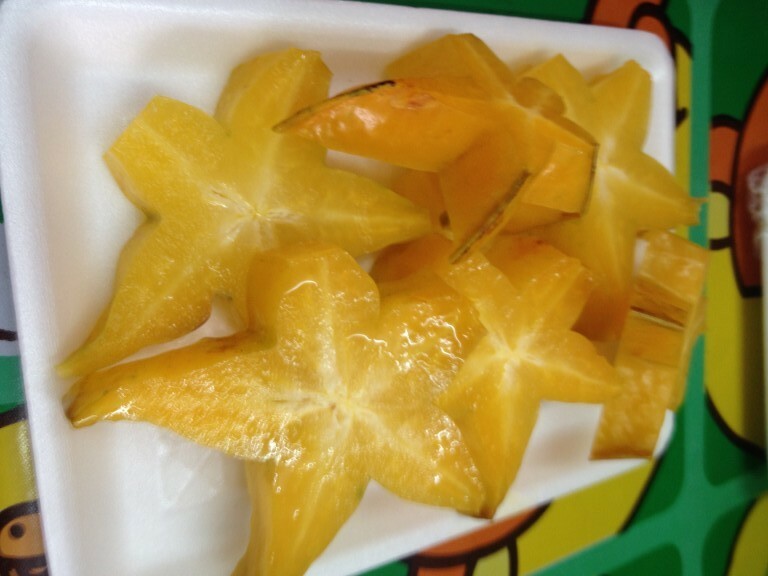 I did, however, enjoy both the flavor and texture of star fruit. This is a fruit that I have seen in the aisles at grocery stores but never tried. I didn't even know that you could eat the skin (you can and should!) It's so easy to eat--you just eat it. Of course, you should slice it if you want to see the beautiful stars. This fruit was also citrus-like, though far less acidic. The bananas tasted the same, but they were all about half of the size of bananas that we have in the states, and they are always in huge bunches. The last fruit I will mention is the biggest, stinkiest, ugliest of them all...DURIAN. Durian is so stinky that many hotels ban their guests from bringing it inside. When I first tried it, I thought it wasn't so bad. It kind of tasted of banana with a mango-like texture. However, I chose not to finish the small piece of flesh I had. 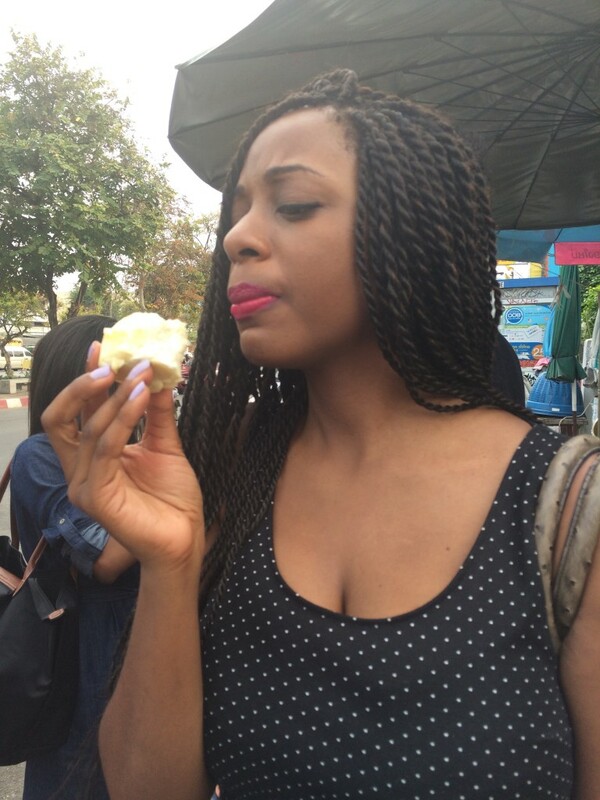 The next day, I had durian ice cream, and the brief affair I had with durian ended as abruptly as it began. Because, well, the ice cream tasted toooo much like durian. "It taste like banana.. and mango.. and something stinky..."
So much durian!! Truckloads of durian..